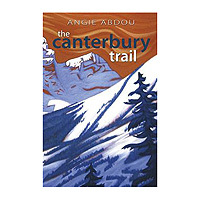 Angie Abdou’s novel The Canterbury Trail (Brindle & Glass, 2011) is a fictional avalanche of the contemporary mountain town, the distinct yet interconnected experience of the characters that call mountains their home and their inevitably colliding destinies. Not unlike the collection of Chaucer’s The Canterbury Tales, it carves through the inner perceptions of each personality and their experience of life – in this case a life of backcountry skiing, snowboarding and snowmobiling. Set near the town of “Coaltown,” The Canterbury Trail brings together sundry characters that can be found in just about any mountain town in British Columbia. From the chronic pseudo hippie, rusty nail pounding redneck, shroomed out real estate developer to urban neophyte wannabe journalist, the novel encapsulates a fateful group of stereotypes confined to a single cabin during the one last big dump of the season. But these characters aren’t stereotypes in a negative sense; as a small mountain town dweller I found myself identifying with each of them on a certain level. It’s a slippery slope to address one’s contemporary culture – Abdou lives in Fernie, BC – but she manages to contrast these co-dwelling, yet contradictory, powder hounds in an insightful and often humourous, if not nauseating (reference to the profuse vomiting in the novel), manner. Abdou’s writing is concise and observant. Her attention to detail and awareness of the backcountry lifestyle, from rolling joints to snow sense to making mushroom tea, is refreshing. But it’s what’s happening on a deeper level – the struggles of bridging a ski bum lifestyle with the necessities of a career, pragmatism and belonging – that are revealed like a ski carving through layers of bottomless snow. There are deeper themes as well: the environment, the struggle to bridge a sense of place with development, sexual ambiguity and family frustrations. You know, the stuff all of us carry around each and every day. The Canterbury Trail is an entertaining portrayal of the people that choose to call mountains home and the risks they face, however cavalier or calculated. It’s a snowflake’s fleeting glimpse for people unfamiliar with the culture of mountain towns, but almost too familiar for those who live there. But that’s the risk of such a novel, and Abdou is commended for her insight and courage to drop in with confidence. Oh, and if you hadn’t heard, Abdou is also the author of The Bone Cage, which was #1 on CBC Book Club’s Top 10 Sports Books and dubbed Canadian Literature magazine’s “All-Time Top 10 List of Best Canadian Sports Literature.” Yeah, she can write, and she just stabbed at the heart of our own transitory, snowy culture. Abdou’s writing is concise and observant. Her attention to detail and awareness of the backcountry lifestyle is refreshing.